There is unrest in the European Union, as its unity and values shiver in the face of recent challenges. Some people go so far that they even doubt the EU will endure. One of the things that scorched the very heart of the European Union is the imminent EURO zone crisis. The so called Grexit has been hardly avoided this year and there are rumours about a rather similar economic situation smouldering in Italy. Spain has also been continuously struggling to regain strenght after a never-ending financial crisis. And some whisper France is pretty much on the same path. Then, there is the imigrants crisis, with countries beginning to build up fences at the same borders where not long ago they took them down. So much for the unity and fellowship between member states. But who could argue about it when fear is lurking at the corner. Increasing extremism culminated with Paris terrorist attacks who ravaged France in November 2015 and makes it hard for people to stay open and courageos. There is also Russia hawling at the Eastern borders, sneering the security and peace in the area. All of these are tied to an apparent fall of democracy, as nationalist parties start to gain ground in countries like Hungary, France and now Poland. So it ain’t that curious that this slow-burning turmoil has also reached the gates of youth world. And although one might not see the connection between the two, youth programs will inevitably play an important role in this ticklish equation. 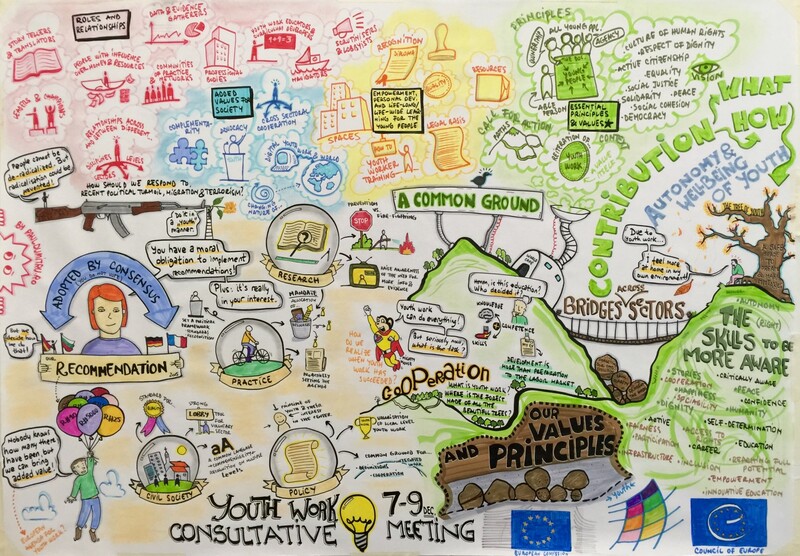 That is why 33 key representatives of youth organisations, governments, youth work development organisations and institutions and other stakeholders of youth work around the continent gathered on 7-9 December 2015 in Strasbourg. They brainstormed, discussed and forged on what a recommendation of the Committee of Ministers of the Council of Europe (CoE) with its 47 member states, including all members of the European Union, should include. The consultative meeting lasted three days and was masterfully lead by facilitator Yael Ohana, specialist on youth policy and intercultural non-formal political education. 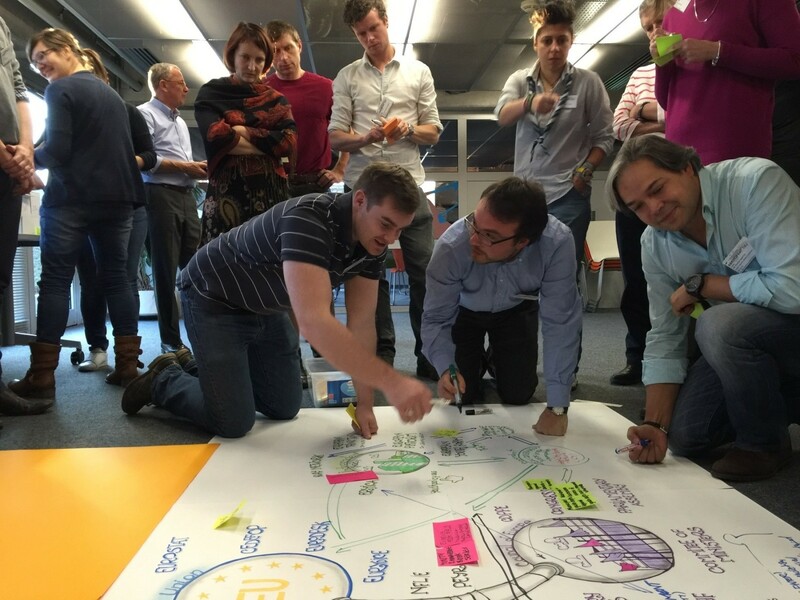 With this occasion, I had the chance to graphically facilitate the process and support people’s collaboration, as well as helping them visualise their work along the way. 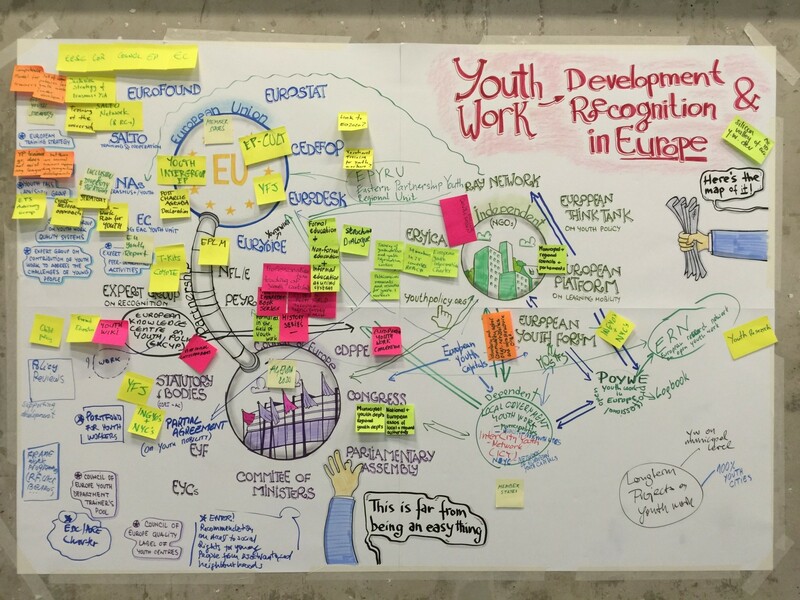 One main thing was drawing the map of the youth work stakeholders within the European Union, onto which people could then add drawings and sticky notes to highlight the connections in-between. This helped to both clarify the way things work inside the system and also to set the base for interaction in a workshop where this was key. The other thing was visually harvesting the conversation that took place. The resulting canvas will serve as a reminder of the meeting and a visual brief that encompasses the most important points, helping organisers to harvest the essence. A Recommendation is practically a set of ideas that is sent as an important piece of advice to the Council of Europe. Afterwards, CoE forwards it to member states as “to do”. And although governments mustn’t necessarily implement it, they have a moral obligation to do so. In a way, that is why a recommendation should be as precise… as it is general. Otherwise, it would be hard to regard it as advice and, for some countries, it will become a sort of too-difficult-to-implement Decalog. By keeping it flexible, each nation has the chance to follow according to its own capabilities. how do we know when youth work has succeeded? what mistakes could be made in the process of supporting youth work? how could we avoid reinventing the wheel? how can we help young people find jobs? how can we respond to recent political turmoil, migration and terrorism? what should we do in order to bind people together, not throw them apart? These are just a few of the topics that participants covered, trying to find answers, perspectives and solutions during the workshop. One way to support young people is sticking to the values and principles of youth work (like social justice, solidarity, respect of dignity, social cohesion, democracy, equality, active citizenship, human rights). Developing programs with bigger impact on inclusion and workforce is another. All of these must be backed up by increased support, recognition, better legal basis and a better inclusion of youth work inside the whole political, economic and social system. Youth work has managed to build a world for youngsters where they feel more at home. Luckily, this will go on. The results of the consultative meeting, converted into a recommendation, will hopefully improve and support even more the development of youth programs across the EU, enriching young people’s lives and helping them to contribute to a better world. Because the truth is that the future of Europe is at stakes and youth work can play an important card in a game that will shape a different path for us all.